The Seto Iseya I-6 Nakiri Kitchen Knife / Vegetable Chefs Knife embraces tradition with a design and style similar to that of a real Samurai sword. In fact, this blade is produced in Seki, Japan where forging is still considered an art form rather than simply work. The techniques that were first mastered centuries ago by Japanese blacksmiths are on full display throughout this knife. The blade itself is forged with high-carbon steel, with 33 layers of Damascus. For further strength and hardness, the blade has a hammered finish which also creates a nice visual alongside the Damascus. The VG 10 steel, made specifically for knives, is meant to hold it’s sharpness for as long as possible. The handle is shaped more traditionally than others in the list, and is accented with a red sandalwood bolster. While the blade is rather heavy overall, it’s balanced well enough that the oversized handle is comfortable in multiple positions. This is a blade that’s suitable for use at home or professionally in a kitchen. It’s slightly heavier than your average japenese chef knife, but this will come in handy when performing heavy duty chopping. The blade is of the utmost quality, forged with high-carbon steel, using a hammered Damascus to create not only a beautiful but very sharp blade. It’s very impressive to look at, but it performs at an equally high level. As an aside, the hammered finish helps to prevent food from sticking to the blade as you’re cutting. The handle is a traditional D-shape, made from black Pakkawood. It looks nice paired with a red sandalwood bolster. Plus, it’s large enough to accommodate multiple types of grip placements and hand size. The Seto Iseya I-6 Nakiri Kitchen Knife / Vegetable Chefs Knife is particularly impressive given its price point. This knife is as visually impressive as any on our list and can satisfy your desire for a traditionally style chefs knife without breaking the bank. 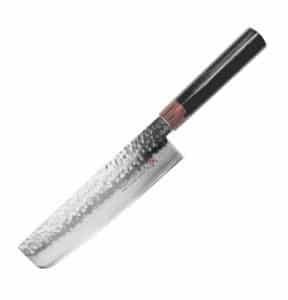 The Seto Iseya I-6 Nakiri Kitchen Knife / Vegetable Chefs Knife could be considered ‘handle heavy’. The balance point sits a bit below the blade, so this knife is a departure from your classic lightweight and balanced japanese chef knife. It is not the ideal knife for repeated, precision cuts. The spine running along the handle can be obtrusive when using the pinch grip, as the handle ends are not chamfered. The Seto Iseya I-6 Nakiri Kitchen Knife / Vegetable Chefs Knife uses the same high-quality steel as some of the priciest knives available. The hammered, Damascus finish looks and performs as well as those same pricier chef knives, too. The design is traditional, with a style utilizing classic Japanese techniques. With its durable Pakkawood handle, this is an attractive knife that performs well. Seto Iseya I-6 Nakiri Kitchen Knife / Vegetable Chefs Knife – This is one of the less pricey options, which is one reason that makes this blade worth considering. What makes this one of the best japanese chef knives is the high quality blade, forged with traditional methods. It cuts as well as knives that costs much more.